CEBU has always been one of my all-time favorite destinations, simply because it gives travelers the best of both worlds—a cosmopolitan feel, yet retaining some of the vestiges of provincial seclusion. To me, it means sumptuous food, both of the sutukil (sugba, tuwa, kilaw) and the upscale dining varieties, fabulous swimming pools and sparkling beaches, friendly always-smiling people, and splendid restful five-star accommodations. If you’re the type who wants to get away from it all, your best bet is Shangri-La Mactan Island Resort & Spa. For picky travelers such as myself, I like the hotel because it is a self-contained refuge where even the most discriminating guest will find everything that will please her to her heart’s content. Once you check in, you won’t ever feel the need to even go to the city to see its sights because the resort in itself already provides the guest with so many experiences that will delight all her senses. THE guest rooms, first of all, are spacious and warm, with furniture that is understated and elegant—a delicate blend of local craftsmanship which Cebu furniture makers are famous for. The headboard of my bed, for example, was made of wicker, while touches on the head lamp above the bed were in banig. The simple furniture was cozy, making me feel right at home. The guest room also had a magnificent view of the sea and the inviting swimming pool below. The king-sized bed guaranteed a tranquil sleep night after night, as I was surrounded by comfy large pillows. The grounds are well-manicured in their refreshing greenery, so a walk even just around the premises becomes a refreshing experience. I especially enjoyed a leisurely stroll into the Chi Spa Village, which relaxes the usual tense and harried guest with the sound of gurgling waters and the aroma of calming essential oils. Sitting on 10,000 square meters, the village is nestled amid the resort’s sprawling grounds and is the first spa village carrying the luxury hotel-spa brand in the Philippines. Later I would delight in a “Chi Journey” that included a revitalizing bath in an outdoor pool which used coconut milk mixed in the waters; an herbal steam bath that instantly decongested my nasal passages as I suffered from a sinusitis attack; an energizing Mountain Tsampa Rub; and an Aroma Vitality massage. The Mountain Tsampa rub uses a barley paste to absorb oils and exfoliate your body of dead-skin cells. It helps revitalize the skin and prepares you for the next ritual: the massage. The Aroma Vitality massage is a blend of Swedish and Shiatsu pressure techniques using the essential oil suited to your element. As in other Chi spas, the guest is supposed to fill up a form which tells the therapist your likes and dislikes in terms of food tastes, colors and temperature. So the essential oil used in your massage is supposed to complement your element (e.g., water, metal, earth, wood, or fire). Unfortunately, the therapist assigned to me wasn’t able to give me the deeper pressure I’m used to and even said I should have gotten a male therapist instead. I thought that response was not only unprofessional but totally ignorant because, as I had pointed out to her, my therapist at Chi in Edsa Shangri-La, as well as those from the other spas I go to, are also female but completely competent to deliver the pressure I needed. Despite the minor disappointment with the massage therapist, my overall impression of Chi Spa was of pleasant satisfaction. The spa treatment was capped by a plate of fruits and refreshing drink. 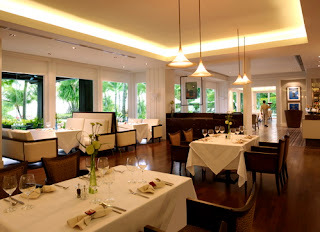 IN terms of cuisine, Shang Mactan has the basic choices in terms of international dishes. Guests have a selection of Asian dishes at Tides, which serves buffet meals for breakfast, lunch and dinner. It was where I enjoyed most of my meals and was impressed that it was able to deliver a varied menu for guests who were staying more than one night. Other hotels, despite their luxury tag, are not creative enough to come up with even a decent breakfast or meals that would delight a discerning guest’s food preferences. And if you’re staying at such a hotel for two or three days, eating the same fare can be annoying. Fortunately with Tides, as well as the hotel’s other restaurants, this was not the case. As with most hotels these days, the standard feature at Tides is the sashimi and sushi bar, which did not tire my palate at all, considering my love of Japanese cuisine. I immensely enjoyed lunch at Acqua with Shang Mactan’s energetic PR girl Sharon Samarista as we caught up on the latest industry gossip in Manila. The restaurant served one of the most delectable Italian meals I have had in the longest time. It truly deserves to be called one of the best restaurants in the Philippines because it offers a modern twist to basic Italian fare, be it pasta, risotto, or your usual meat and seafood dishes. Everything I ate, from the refreshing arugula salad, flavorful pumpkin soup and tender salmon, to my dessert of pana cotta in three different flavors were just divine. What’s more, the restaurant also offers vegetarian fare for health-conscious guests. The restaurant overlooks the infinity pool, which some guests may find to be an entertaining diversion, especially if those swimming have gorgeous bodies. If that isn’t your cup of tea, you can move to the other corners of the spacious restaurant for a spectacular view of the ocean. Cowrie Cove, which overlooks the Visayan Sea, appropriately serves up seafood specialties in a buffet spread. Name it, they have it—lobsters, crabs, shrimps or prawns, lapu-lapu or the freshest catch of the day, cooked in various succulent ways. It is quite a walk from the main building and sometimes a tad difficult to navigate around due to the low lighting conditions of the restaurant. Nevertheless, the outlet gives guests a distinct Cebuano alternative to the cosmopolitan array of meat dishes in the hotel’s other restaurants. Satisfied with the excellent quality of its restaurants (have you ever been disappointed with a Shang restaurant anyway? ), I told Sharon that I intended to return to have a go of the sumptuous offerings of the Chinese restaurant Tea of Spring. Other than the spa, the restaurants and the really awesome pools, guests can enjoy the hotel’s other conveniences, such as a business center well-stocked with foreign business and local newspapers (that’s why I got hooked again on the Asian Wall Street Journal); a gym/health club with top-of-the-line equipment; bars by the pool, the beach and at the lobby; an indoor playground, dubbed Adventure Zone, for their kids; or if they wish, they can also stage their own private singing contests—good Lord!—in the karaoke room. But more than these pleasant diversions, what is truly endearing about Shang Mactan is its cheerful well-mannered staff. Everyone is available for any question or concern a guest may have, no matter how simple or ridiculous (I lost my way going to the spa, for example, duh). Each has a ready smile and a helping hand for guests, so it’s no wonder a lot of foreign and local tourists love staying at this resort. It’s a hotel where guests can truly be made to feel at home. Hi. 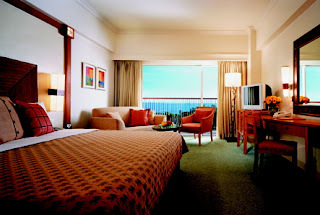 My family are going to Cebu this September for a short vacay and we are to stay in Shang too. 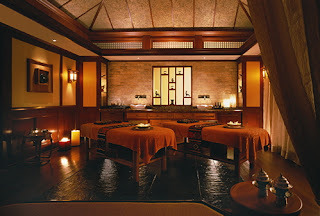 I am very excited to try the Chi Spa too and would like to know the rates for their packages (an estimate would be fine). I tried Googling their rates but wasn't very successful. Thanks for any info you might give! you will spend at least P5,000-P6,000 for a package.